The sibling team of Reta Howell and Vana Howell of THIS Gallery have taken recycling into their own creative hands with their THIS Light series. 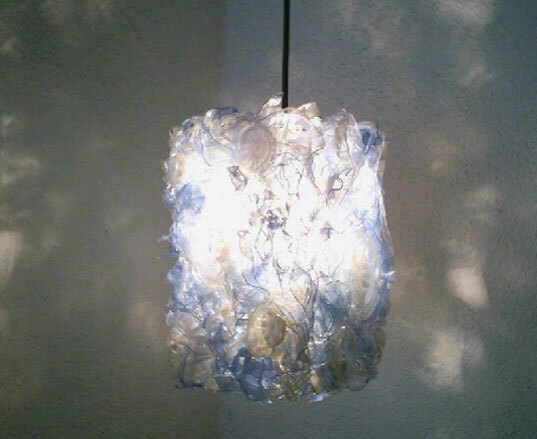 Made from discarded plastic bottles that the two salvage locally, THIS Light turns landfill destined “trash” into delightfully repurposeful lamps. Each fixture is original and handmade, and incorporates every piece of collected plastic into the design. The results are an enlightening display that also serves as a beautiful “reduce, reuse and recycle” reminder. The Howell sisters scour local ball parks, school grounds and public spaces for plastic bottles to rescue materials from ending up in landfills or floating out into nature on currents and winds. Their found objects of choice are gathered, 30-55 per lamp, and then hardened with a fusion process that results in a glass-like look. These repurposed materials take new form in fun lamps with decorative parts that will last for generations. All the lamps in the THIS Light series are designed to use CFL bulbs. THIS Gallery currently has a special promotion going on right now where if a customer ships 3 cases of empty bottles, they’ll receive $100 off the purchase of a lamp. How does the solar bulb from water bottles work? This is great. What a conversation starter! The sibling team of Reta Howell and Vana Howell of THIS Gallery have taken recycling into their own creative hands with their THIS Light series. 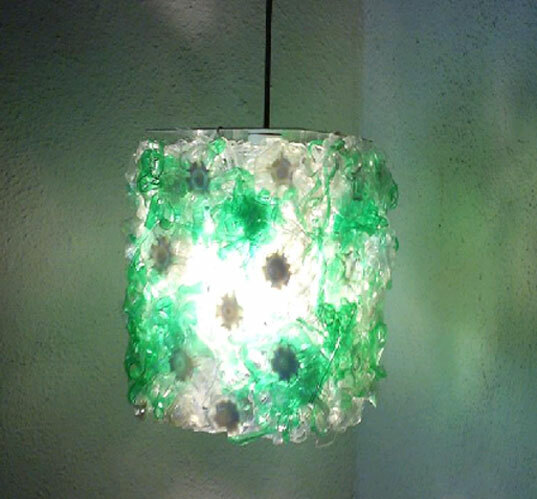 Made from discarded plastic bottles that the two salvage locally, THIS Light turns landfill destined "trash" into delightfully repurposeful lamps. Each fixture is original and handmade, and incorporates every piece of collected plastic into the design. The results are an enlightening display that also serves as a beautiful "reduce, reuse and recycle" reminder.